The Blockchain / Bitcoin myth starts with the name Satoshi Nakamoto, which is a pseudonym used by the unknown person or people who developed bitcoin, authored the bitcoin white paper in 2008 and deployed bitcoin’s original reference implementation. Blockchain was invented as a by-product of the invention of bitcoin as a way of technically solving the problem of double-spending with a digital only currency. The problem of double-spending is that unless you have a trusted intermediary that validates transaction how can you be sure that a unit of value, when held digitally, isn’t just simply reproduced and spent again. By solving the problem of double-spending, blockchain allows the development of virtual / digital / crypto-currencies which do not rely on intermediaries. The same ‘proof of transaction/value’ that blockchain can provide however provides a powerful tool for the effective management of other digital value without the use of intermediaries. The truth is that no one knows exactly who developed blockchain, but the fact is it’s here and initial signs certainly suggest it is here to stay. So, what actually is blockchain? To put another way, picture a spreadsheet that is duplicated thousands of times across a network of computers. Then imagine that this network is designed to regularly update this spreadsheet automatically. You now have a basic understanding of the blockchain. Information held on a blockchain exists as a shared, and continually reconciled ledger of transactions. Academics refer to the technology as Distributed Ledge Technology or DLT as this is effectively what it is. This is a way of using the network that has obvious benefits. The blockchain database isn’t stored in any single location, it uses a distributed network model (see below) meaning the records it keeps are truly public and easily verifiable. Centralised – classic one that we used to use for office networks and small/medium websites, with centralised hosting. Decentralised – this is like cloud hosting, relying on a peer-to-peer network built on a community of users. 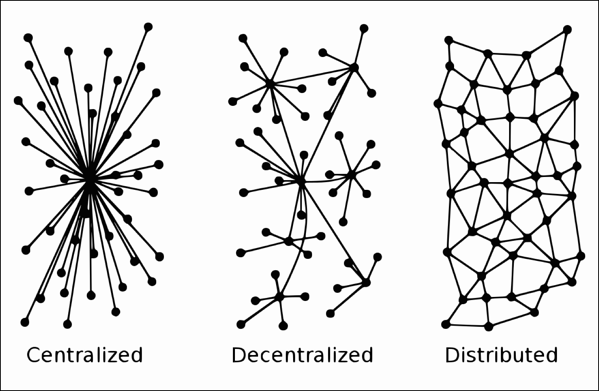 Distributed – this is the model that the blockchain uses. You can only overpower the network if you have access to more computer power than all the rest of the network together, making it highly secure. Without going into the full technical details of the cryptography and also avoiding terms like mining there is something very important about the way the blockchain is formed. Each new block contains a fingerprint of the last block in the chain. This fingerprint is used in the cryptography process and therefore impacts the way the data is recorded. The thing to remember about this is that if you wanted to change a single block, because it has this finger-print, you would also have to change all of the other previous blocks because by changing a block the fingerprint is changed each time. This means in simple terms that if you want to change a blockchain you have to overpower all of the other computers in the network that access this blockchain in order to then change every single previous block in order for your changed blockchain to reconcile across the network. In practical terms this isn’t possible and therefore it is assumed that the blockchain is UNCHANGEABLE once written. For us as digital marketers the real question is what will be the impact of blockchain on digital marketing? There are a number of potential impacts and they could have benefits for businesses as well as consumers. Peer-to-peer transactions – with blockchain there is no need for a bank to authorise the transfer of money, which means eCommerce with no bank fees. This means more money for eCommerce businesses and also potential savings for consumers if businesses decide to pass some of their savings on. Hold your own auctions – there will be no need to use services such as eBay or Amazon Seller who take a cut of the profits because with blockchain as soon as someone makes a purchase the money will be transferred. Blockchain browsers – these types of browsers aren’t the future, they are here now, and are a potentially more secure and private way of browsing the internet. However, we will cover what people will understand as a web browser that uses blockchain within its architecture, which is Brave. There is another close option which is the Android specific version of Opera, but that is not as interesting for our look forward. Brave is a web browser in the traditional sense like Google Chrome, Microsoft Edge or Firefox, but it champions your privacy. The browser blocks unwanted ads which are run on many popular sites, streamlining your browsing experience and preventing trackers from recording your location, behaviour or other browsing activity. Crucially it uses blockchain as the technical foundation for a new way to monetise website content and advertising. Some estimates put click fraud caused by bots as high as $7 billion per year. It’s important to note that Brave still allows advertising, but it’s permissive, not compulsory. You can select which sites you allow to show you ads and this helps people to stay private and retain control of their data. Crucially people’s personal data resides on the individual’s own device and is NOT saved on a public blockchain! If you want to give the Brave web browser a try, then you can download it for Windows and Mac. How will Brave’s use of blockchain impact digital marketing? There are some immediate impacts of the way Brave have used blockchain for your digital marketing. Diminish the effectiveness of paid search – less targeting (because of the anonymisation of the user and lack of tracking) means paid search will be less effective. Remarketing becomes a problem – without the cookie on a user machine to tell you someone visited your site, it’s impossible to remarket! Display advertising becomes ineffective – if there is a widespread adoption of this technology, then this will be a big problem as display ads simply won’t show due to being blocked and if they do show from a service like Google Display Network how well targeted will they be? Measuring advertising effectiveness – this is going to change, as the metrics we are used to using will be replaced by new measures. Your Google Analytics data becomes inaccurate – with technology blocking scripts and trackers it also stops your GA from working, meaning you don’t know how many sessions your site received. The foundation principle for the Brave browser is to give the user the control of rewarding publishers for great content, without necessarily selling ads or implementing a pay wall. With the concentration of 73% of all digital marketing spend with just two companies publishers are struggling with declining revenues. Many content publishers have tried pay walls, for example the Times / Sunday time where they charge users a subscription fee to content. Others have tried by monetising through referral / affiliate schemes, such as Future Publishing. Basic Attention Tokens or BATs as they are referred to, are a new way of helping publishers of quality content monetise this. The principle is that the user gets credits for using the Brave browser and can then choose how to allocate these credits to publishers they want to reward for great content. This can be done on a proportion of time that the user spend on a publisher’s website and / or one off tips can be given in BATs to sites that provide particularly helpful / good content. Users can also choose on a site by site basis which sites they will see the adverts for. We think that the model is not complete in that it really requires an advertising system to allow the advertiser to set up and run campaigns with the payment being BATs to the users. There are some options that are open to the Brave team here and we are looking forward to more sophisticated options for the advertisers to drive the model and its revenue forward. Blockch ain is the underlying technology that will power the BATs by having a distributed ledger that allows the exchange of these tokens between the participants in the brave ecosystem. Blockchain is the perfect technical solution for BATs as it allows the direct transfer of value credits between different, often unknown participants. The system becomes decentralised and therefore does not suffer from the duopoly problems that people point to in the case of Facebook and Google. While personal data is not stored on the blockchain by Brave the system is also founded on the protection of personal information. So much so in fact that when you open a private browsing window in Brave you benefit from your website page requests are bounced around three Tor servers thus anonymising your connection and location. All browsing history is saved on the local machine and if the user switches to DuckDuckGo or Quant as their search engine then no search data will be recorded by any third-party either. If a visitor to your website is using Brave with just the default settings then they will not even appear in your Google Analytics data as a visitor. Therefore if there was large-scale adoption of this technology you could see a point where people would need to analyse log files in order to get an accurate picture of visitor numbers and pages that were viewed. For anyone who has been in digital marketing as long as I have and remembers log files – it's not a pretty way of looking at user activity on your website. What can I do about Brave and its use of blockchain in digital marketing? So, if Brave and blockchain is going to have the above impacts then what are we doing to do as digital marketers to overcome them and keep our efforts working? How can we stay ahead of the competition and even use its implementation as a way to gain competitive advantage? Improve organic search, so you’re not so reliant on paid search. But you need to be aware of personalisation that is coming from AI which will be blocked as privacy for a user is defended. So, you must target more bold, broad terms for our attention. This means investing more in the development of your domain authority through quality link building. Gated content and then enrolled workflows get more people to give you permission to communicate, so you don’t need to worry about them hiding their ID from you. For this to work your gated content needs to really give the user value, otherwise they won’t share their personal details with you. Give users even more reason to return naturally. If they love your content, then you don’t need to worry about remarketing not working. Create better and better content and people will keep coming back for more. The other side of SEO work is to look at targeting niche terms (the long tail of the distribution bell curve) what else can you target that brings relevant people in? If your Paid advertising is going to be less laser targeted, then how can you improve it? The answer is making your conversion rate on the site better. Work on CRO & UX to squeeze more conversions out of your traffic and keep the paid ROI positive. Staying aware of the new opportunities and challenges, then think about the best course of action for your business. This means reading our blogs and that of others that are up-to-date on new developments. We will also be running further events on new technology as we have for the past few years. If you are interested in attending please get in touch. Blockchain is not a fad, it’s going to change our world and it’s important to be aware of it. Awareness and taking the necessary steps can help you to gain a competitive advantage over your competitors. Brave is just one application of blockchain that will impact digital marketing. We can see that decentralisation of control and direct payments will impact what we do as businesses online. We are going to be providing more in-depth information on these subjects in the future. Get in touch to ensure you are on the email newsletter so that you are alerted to the new content. If you would like to find out more about how you can develop your own specific digital marketing approach to gain a competitive advantage from the changes blockchain is bringing, then please contact our team using the button below who will be happy to start a conversation.